Google webmaster is one of google's great application for every webmaster's to dig more on their on websites. Especially if the webmaster wanted to know how google bot sees their website. There we can see what does most people on our websites query for. Also, we can see which other websites that provide links to our website. Want to see it more clearly ? just open webmaster.google.com and type in your gmail's account to log in. In google webmaster, first you need to register your own site, and then verifies that the site belongs to you. Google provides 2 mechanism for verifying your site. The first method asked the webmaster to add a new html page with some random name provided by google. We must upload it into our site directory and then ask google to verify it. 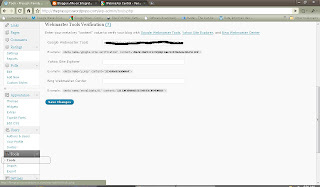 The second method is to add meta tag in your website. If you're using free blog from wordpress, using wordpress.com domain, you will not be able to do the first verification method. Your best bet is to use the second one, which will be explained below. After you add new site to google webmaster, it then brings you to a verification screen. Here, you choose Meta-tag for verification method. Copy paste the meta-tag provided by google, and then go to your admin page of your wordpress.com blog. In your admin dashboard for wordpress.com, go to menu Tools located on left bottom of your page. There should be a page written Webmaster tools Verification on center pane. Paste your Meta-tag there, and dont forget to Save changes. Back to your google webmaster page, click Verify. After 10-15 minutes, check back to see if it's already verified. My other blog is at http://theprasojos.wordpress.com , how about you ?